Vacuum forming is a manufacturing process by which a sheet of plastic is heated and pressed over a form to create a part. This process is used to create many of the products in your home such as plastic containers, tubs, sink units, and electrical enclosures. 3D printing is a great way for manufacturers to create low cost molds for low volume manufacturing or prototyping. While working time will vary, this process took us about 1 hour from start to finish. In order to vacuum form you will need a mold to vacuum form around. Your final parts will be nearly exact replicas of your mold. You can download molds from sites such as GrabCAD, but we chose to design ours. For our model, we designed a common taxi sign used to show whether or not cars are available for service. 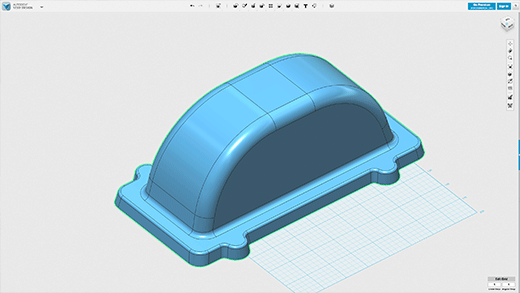 When designing a mold for vacuum forming consider drafting angles. Drafting angles allow your molded part to be removed from the mold. They should typically be anywhere from 3-5 degrees from 90 on any vertical surface. When preparing a model for vacuum forming in MakerBot Print, there are some print settings that should be taken into account. We printed our model with 4 shells at 25% infill. Next, print your model. We printed our model on the MakerBot Replicator Z18 because of the large size of our model. 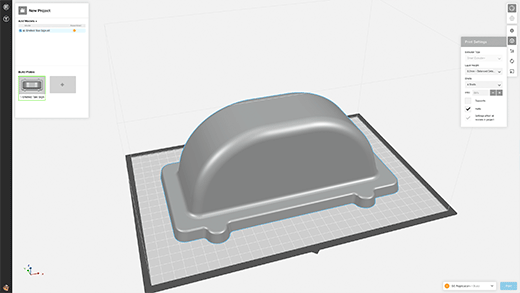 Increase shells and infill settings to create a strong mold that will withstand the pressures of vacuum forming. Because we used an industrial vacuum forming machine we needed to secure the mold to an additional fixture. This holds the mold in place against the various forces that occur when operating the machine. We started with 12 x 24 inch sheets of white polystyrene plastic about .75mm thick and worked up to ¼ inch thick sheets of PET-G. 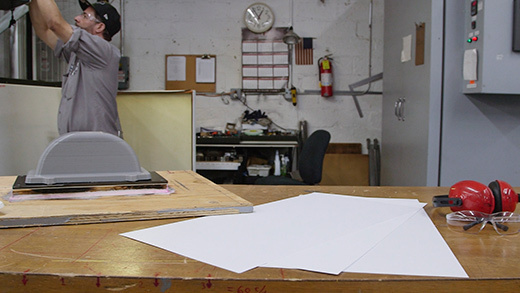 When choosing plastic sheets for vacuum forming, consider the thickness of the plastic and the size of the sheet as well. Thicker sheets will need to be heated to higher temperatures and will require a higher power vacuum. B. Heat plastic to desired temperature. Because we used an industrial vacuum forming machine, our plastic was heated automatically to temperature based on the type of plastic, thickness, and density. While 400 degrees fahrenheit is close to the melting point of PLA, only the sheet is heated and not the form. This means the heat is not necessarily a concern in low volume production or prototyping. Choose thinner sheets of plastic if your vacuum forming machine does not create large amounts of consistent heat or suction. Typically plastics will be heated somewhere around 400 degrees fahrenheit. Once plastic is heated, it is pushed over the form. At this point you will notice that the vacuum suction will pull all of the air out from under the heated plastic sheet and it will be forced down over your mold. The plastic will begin to cool instantly. Once all of the air has been removed from under the plastic and it has been formed over your mold, remove the formed part and set it aside to cool. This process can be repeated to produce many of your desired product. If you notice that over time your 3D printed mold becomes deformed due to heat or pressure, it might be time to print another. Because printing is such an inexpensive option for mold production, producing 2-3 spares up front is not cost or time prohibitive. After you have produced the desired number of parts, cut away any spare plastic. You can cut away spare plastic using a manual cutting tool, or with a CNC. If you’re using a CNC, 3D printing is a good solution for creating custom fixtures. Here, you can see what successfully vacuum formed plastic sheets look like. Special thanks to our friends at COMCO Plastics for all their help.